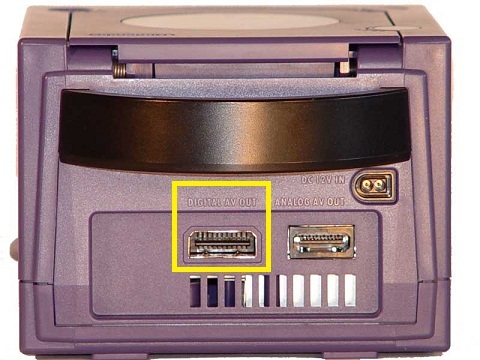 The reason the GameCube’s output options are complicated is because the GameCube primarily outputted in 480i (which is interlaced). There were a few games that outputted in 240p (such as the Zelda and Mega Man X collections) and many that outputted in 480p, but sadly, some only supported 480i output. If you’re not familiar with these terms, I highly recommend you read the 240p page before continuing, otherwise the rest of this page might not make any sense. – If your display supports component video, you can simply use the component cables. – Expert option: If you mod the component cables for VGA, you can also use them in an RGB mode for 240p and 480i games! Some displays will accept the signal through the VGA cable as-is, with no further conversion. For other displays, you can use a sync combiner to convert RGBHV to RGBs. I use an Extron 203rxi, which converts sync any way you need it. Either way, make sure not to run the GC in progressive mode for RGB output. This worked perfect in 240p and 480i modes, on my Sony PVM, which doesn’t accept any 480p or VGA signal! – For the best quality, do the expert option listed above (component cables modded for VGA) and run the VGA cable in RGB mode (with the sync cables combined). – Even without a VGA mod, you can use the component cables on monitor’s that support component-in, just don’t enable progressive scan mode. – If you have a PAL GC, you can simply buy an RGB cable that gets sync from composite video (not csync). – If you have an NTSC GC, you can buy a cheap S-Video cable. It won’t be as good as RGB, but it’s better than composite! – Expert option for 240p: You can buy the component cables, mod them for VGA (or buy a component-to-VGA converter), use them in progressive mode and route it though an Extron Emotia (or similar) to force a 240p mode. – Expert option for 240p / 480p: You can use Swiss (using either a SD booter, or a modded GC) to force a 240p or 480p mode. Forcing 480i to 240p will work regardless of what cable method you choose, making it a great option for NTSC GC’s with S-Video output. 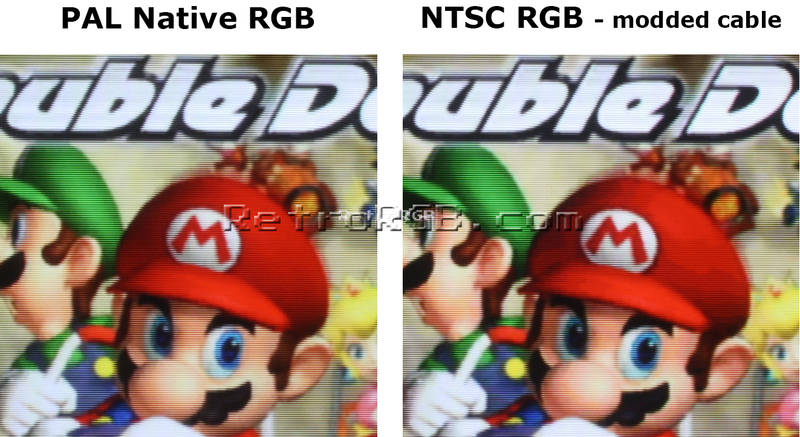 I haven’t done a component vs VGA picture comparison yet, but I can confirm that the output quality is extremely close. I’d only do the VGA mod if your display can’t accept a component signal, if you want both RGB and VGA from one cable, or if you’re a die-hard GC fan that wants the absolute best possible output, regardless of how small a difference.